PR: Zoran Corporation has announced that its Zmedia-based technology powers the portable iSee 360i video recorder selected Best of Show at Macworld. The iSee 360i video recorder for iPod, from Advanced Technology Office, LLC (ATO) and powered by Zoran, is the first and only portable media player that enables users to record video content directly onto most Apple iPods and then to view it on a high-quality 3.6" LCD screen. 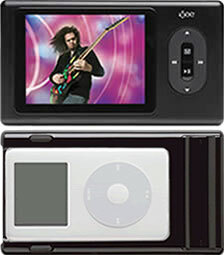 The iSee video recorder allows millions of iPod owners to add the power of video to their device while also dramatically expanding the universe of content playable on the iPod. "Our long term partnership with Zoran has produced the iSee 360i video recorder that allows millions of iPods owners to add video recording to their device and has produced a new category of consumer product that we are proud to deliver to market. We believe consumers will be very pleased with the larger 3.6 inch screen and the extended four-hour battery life. We appreciate the high level of expertise and support extended by Zoran to help us deliver this Best of Macworld product," said John C. Scott, ATO cofounder and former Apple executive. "Zoran remains focused on delivering the highest quality audio and video technology for consumer devices. We are always pleased when our customers, such as ATO, gain well-deserved recognition for their innovative designs using Zoran technology. Zoran's Zmedia initiative is extending our high performance technology to smaller hand held portable devices that are quickly gaining favor with millions of consumers," said Dave Pederson, vice president corporate marketing. "If you feel you aren't getting the most out of your iPod battery, perform the simple test below before considering battery service or replacement. This test will help you determine how much life (playback time) you are truly getting from your battery. You may find that all you need to do to increase your battery's performance is to follow the guidelines on the iPod battery website. "Note: The iPod battery indicator shows approximately how much charge is left in the battery. In some iPods, you may find that the battery indicator shows some charge left, but your iPod stops playing because the battery is, in fact, empty. In other cases, the battery indicator may show less than a full charge even though you've fully charged it. "Additionally, the battery meter may not update to show a full charge (after you've charged it) until after the iPod hard disk spins up. This does not necessarily mean something is wrong with your iPod battery." Brief summary: Starting with a fully charged battery, run your iPod until it stops. Be sure to note start time and stop time. PR: Monster has announced the launch of iCarPlay Wireless Plus for iPod nano and video and iCarPlay Wireless Plus for iPod Shuffle. Monster's latest products allow iPod users to play stored music wirelessly through virtually any FM station on their car radios while simultaneously charging their iPods. 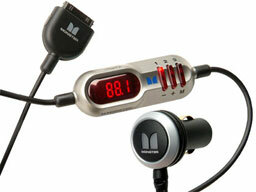 "Ever since we released the iCarPlay Wireless Plus for iPod, it has been an incredibly popular product. That product made it convenient for these iPod enthusiasts to listen to their tunes through their car stereo systems," explained Noel Lee, The Head Monster. "We are now releasing two products so that iPod nano, video and shuffle users can have the same high quality music experience and keep their players charged at the same time. These new products include digital FM tuning, programmable presets and fast charging for clear stereo sound wherever they go." With some FM transmitters, finding an FM frequency clear enough to play stored music through can be difficult, especially while driving through different areas and terrain. To counteract these issues, iCarPlay Wireless Plus for nano, video and shuffle can be tuned to almost any clear FM station, so the music lover has full FM tuning flexibility in getting the best possible sound. Connecting is easy. Simply tune the car stereo to any clear FM station, tune iCarPlay Wireless Plus to the same station, hit play on the player, and that's it. The presets can be changed any time a clearer station is desired. For added convenience, you can preset up to three of your favorite stations. For added flexibility and convenience while listening, these two products feature Monster Smart Digital Charging technology that rapidly recharges the connected iPod. The iCarPlay Wireless Plus for nano and video retails for $79.95. The CarPlay Wireless Plus for shuffle retails for $59.95. PR: Not just another "jump on the bandwagon" iPod audio system, the iSongBook brings new and innovative features to the table. The iSongBook utilizes the new "Universal Docking Station" from Apple that fits all iPod models. The flip-down dock charges your iPod while it plays and stows away when not in use. The second speaker detaches from the main unit for true stereo imaging, up to 6 feet with the built-in cord. The iSongBook also features an AM/FM tuner, 5 station presets, on-demand backlight, sleep timer and an alarm. Wake to a pleasant tone or to your iPod, the choice is yours. The credit-card sized remote controls all of the iSongBook functions, (except on/off), and many iPod functions, such as playlists and albums. There's a stereo headphone jack for private listening and an auxiliary input for use with other devices. The magnetically shielded drivers allow for the iSongBook to be placed near or used with televisions or computers. The best part is the iSongBook is portable! It's small enough to fit in your backpack or suitcase and operates on 6 "AA" standard or rechargeable batteries. It even features a built-in battery charger. With all of these features packed into this "Made for iPod" product, why settle for anything less? iSongBook was awarded the "Plays of the Year 2005" Award from Playlist Magazine in the "Best Transportable iPod Speakers" category. The iSongBook Carry Bag is the perfect accessory. It helps protect your iSongBook from Mother Nature and everyday wear and tear. Take your iSongBook everywhere. Tivoli Audio products carry a one year warranty against defects in materials and workmanship. Please consult the dealer from which you purchased this product for warranty service or repair. PR: Iconz combine eye-catching artwork with complete protection for the iPod nano. Part of an exclusive collector's series, these highly durable cases feature pop culture icons that cover the entire face of the iPod nano and a translucent back. Iconz offer play-through control for the Click Wheel and built-in screen protection. Iconz come in a variety of officially licensed designs. Grab your Iconz today, because each of these hot styles will only be available for a limited time! In-Stock and available for shipping today. PR: If you've lost some or all of your music library but still have the tracks on your iPod, Ollie's iPod Extractor is the application for you. Featuring a one-click interface, just sit back and watch Ollie's iPod Extractor recover your songs. While this will copy files from any iPod to any Mac, it will not create duplicates of songs already in your library. Additional features include syncing of playlists, song ratings, and play counts.